« Azure Site Recovery (ASR): Native DR solution for Azure IaaS applications is out! This is the most exciting part of the Microsoft Skype for Business Server 2019. When this version is used in a hybrid topology, on-premises users are able to get their hands on the same apps that the cloud users can get like, for voicemail support, Cloud PBX users use Azure VM and not Exchange Unified Messaging, with Microsoft Skype4B Server 2019, users can leverage the same techniques too. A support is given for Hybrid Modern Authentication for all users. 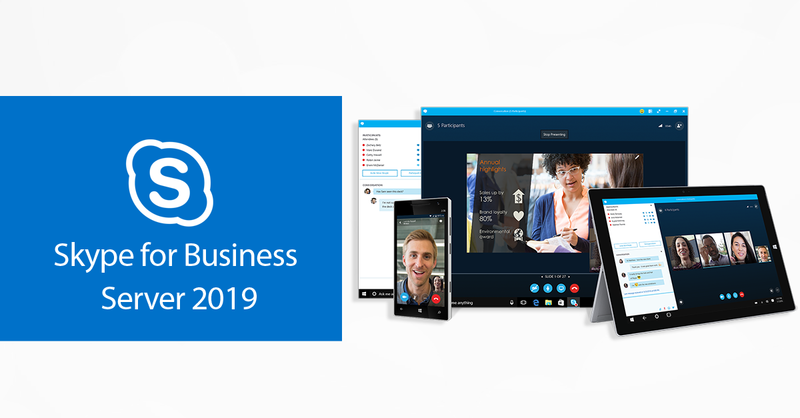 Further Hybrid aware Microsoft Office 365 Portal for Microsoft Skype for Business Server 2019 is introduced which simplifies easier management for Skype for Business Online/On-Premises /Teams. The Microsoft Skype for Business Server 2019 enable all users, whether they are on-premise users or Skype4B Online users, to get access to cloud voicemail. Cloud Voicemail feature can be used when Microsoft Skype for Business Server 2019 is paired with Microsoft Exchange Server 2019. The new Exchange Server 2019 is not offering Unified Messaging. This technique of Cloud Mail is an alternate to that. With Cloud Mail, voice messages will be able to get stored in a user’s inbox. However, if you don’t wish to migrate to Microsoft Exchange Server 2019, you can still continue to use the voicemail feature that is provided by Unified Messaging on your current Exchange deployment. For those who are planning an up-gradation to Microsoft Exchange 2019 should first plan to deploy Cloud Voicemail. The Cloud Call Data Connector enables simplification of call monitoring in a hybrid environment with the help of online tools which enables monitoring of users call quality. Call Analytics is essential to every Call related system. This feature has been integrated to the core experience related to management and administration in Microsoft O365. Now, you have the ability to upload call quality data into your O365. It means there is no need to store this data on local devices. With Microsoft Skype for Business Server 2019, CQD (Call Quality Dashboard) is available for on-premise users. Administration experience has been improved in the latest release of Microsoft Skype for Business Server to make users move from on-premise to Teams. The experience to migrate to Microsoft Teams has been further streamlined for on-premises users. This is crucial for those on-premises users who plan to shift to the cloud. This TLS 1.2 support provides additional security for the Microsoft Skype for Business Server 2019 users and this version of Skype for Business Online deprecates TLS 1.0/1.1. MachPanel provides a way of smooth Enterprise Voice with its Skype for Business Automation experience for its customers who offer hosted or on-premise Microsoft Skype for business Server 2019, 2015, Lync 2013 and 2010. With MachPanel, you can get an automated experience of Skype for business in your environment as a hosted service. The support and management of the automation module is persistent throughout for a hassle-free user experience at your end. The Multi-Cloud Service Orchestration & Delivery Platform (MSOP) offers Hosters and Partners a lot of options to manage communications like Billing and Reporting, Dial Plans, Response Groups, Phone Numbers, Persistent Chat in a reliable manner. It offers professional support for 24/7. MachSol also offers complete Turnkey solution where its certified and experienced technology experts can design and deploy highly available and secure Skype for business infrastructure. So, all you Skype for Business Online users, grab this opportunity and switch to MachPanel for an excellent Microsoft Skype for Business Server 2019 experience for a better communication channel in your business. This entry was posted on Friday, November 9th, 2018 at 12:43 pm	and is filed under Announcements, Microsoft Skype for Business. You can follow any responses to this entry through the RSS 2.0 feed. Both comments and pings are currently closed.